A cigar maker Cuban nationals on Tuesday broke his own record, by making the world's longest cigars, cigar monster that ran along the 81.8-meter (264 feet, 4 inches), or almost as long as a football field. Cigars, which was placed in the ranks of the table, stretching through El Morro, the ancient Spanish fort located in the upper Bay of Havana, Cuba held a ceremony where the annual International Tourism Fair. 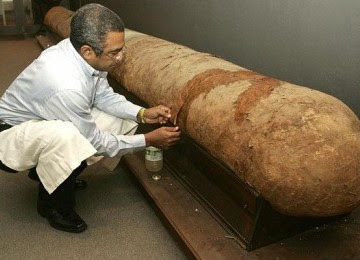 Cigars, which if officially accepted by Guinness World Records in London, will beat the previous record of cigars - which has a length of 45.38 meters. Both cigars were made by Jose Castelar Cairo, better known by the name "Cueto". Cueto (67) previously had a record-breaking four times and feel it is a matter of national pride for Cuba, producing the best cigars in the world. Cueto, who learned to roll cigars when he was five years old, began working on his cigar at this time on 25 April and helped by some people. The length of the cigar is justified by Rhys Patrick of the British Embassy in Havana. Patrick said the information will be sent in a letter to Guinness for confirmation on the record.